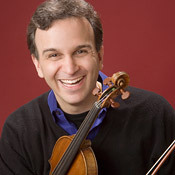 Thanks to the generous support and parternship of the Milwaukee Symphony, we are excited to announce that violin soloist Gil Shaham will be giving a masterclass for students of the String Academy on Saturday, March 12, 2011, from 10:30-12:30, in the UWM Recital Hall. This is a rare opportunity to learn from one of the greatest violinists of our time. The class is open to the public.